Experience beautiful terrain! Our experienced guides will lead you into Whistler's hidden Valley to travel remote mountain trails along Whistler's pristine landscape. Journey deep into the forest and then ascend to spectacular views of the valley and village below, as well as the numerous glaciers throughout the valley. A must see for all ages! Whistler activity discounts on ATV Tours here... We guarantee the lowest Whistler ATV tour prices, so reserve online today and save your time and money. 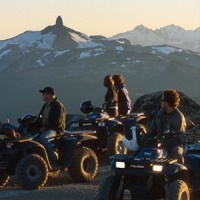 Follow this link for Whistler ATV Tour discounts.